Description: J. C. Smith,winner of the 2012 Metro Newspapers Best Of Silicon Valley “Best Original/local Band”, and 2006 Bay Area Blues Society West Coast Blues Band of the Year award winner is originally from the San Francisco Bay Area. He is an outstanding performer noted for his energy and charisma. 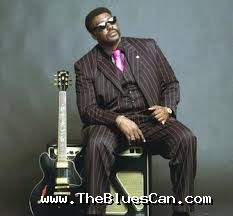 Prior to playing guitar, he was the drummer for the Back to Back Blues Band. In 2000, he emerged from behind his drums, armed with a Gibson 335. J. C. attacks the Blues as if he is being guided by the masters like T-Bone Walker, Albert King, and Johnnie Guitar Watson. The J. C. Smith Band’s current release “Defining Cool” is by far the best recording to date. Listed for the 52nd Grammy Awards for “Best Contemporary Blues CD,” it entered the Living Blues Radio Charts at #16 and was a “Pick to Click” on XM Radio. After 20 weeks on the Roots Report, the CD climbed the charts as high as #25 nationally. In 2004, Smith released “That’s What I’m Talk’n ‘Bout,” co-produced by Grammy Award Nominee Joanna Connor.